We see cycling as a convenient, attractive and safe travel choice for anyone, whatever their age or fitness. We want the proportion of journeys made by bike to increase from 2 per cent today to 10% by 2025. 37 miles of largely segregated cycle lanes since 2013. 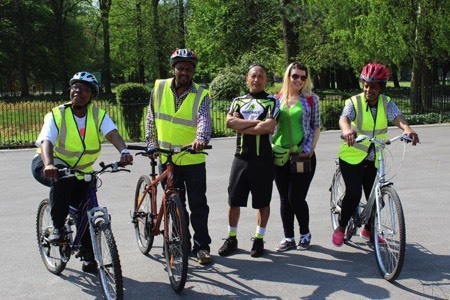 9,000 people have had free bike training sessions. Secure cycle hubs at bus, train and Metrolink stops, with more on the way. Working with schools and colleges to promote cycling. 28 miles more new or improved cycle lanes by 2018. Four cycle-friendly district centres to focus investment on cycle routes and parking. More cycle and ride facilities and transport interchanges. Better facilities in and around more schools and colleges. These improvements have been partly funded by £42m from two Cycle City Ambition Grants, awarded by the Government, and the Local Sustainable Transport Fund. See the full Greater Manchester Cycling Strategy.